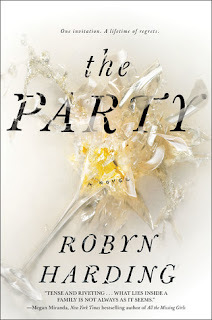 The Party by Robyn Harding is a so-so domestic drama. Jeff and Kim Sanders are throwing a sweet sixteen birthday slumber party for their daughter, Hannah, and four of her friends. Kim has listed the house rules to the girls: no alcohol, no drugs, no boys. They provide food and leave the girls alone in the downstairs family room. Naturally, the girls don't follow the rules, resulting in disaster. One of the girls, drunk, crashes through a glass-topped coffee table and is rushed to the hospital in the middle of the night. While the police investigation cleared the Sanders from culpability in the accident, the mother of the injured girl files a lawsuit asking for three million dollars. The impending lawsuit alienates friends and causes division, as secrets are revealed and nothing is as perfect as it appears. The narrative is told through four characters: Kim, Jeff, Lisa (the mother of the injured girl), and Hannah. Sure, we learn their secrets, but the secrets are not as shocking as the blurb for the novel implies. They are, actually, pretty standard stuff and can be revealed on both sides of the lawsuit, something that no one seems to be pointing out about the mother of the injured girl. It also seems unlikely that one of the five girls would not break down and tell the truth instead of the half-truths/lies about what happened. Additionally, this is one of those novels filled with unlikable characters. You may try to find someone to pull for, but you will likely be let down as the few characters that seem to take a stand also don't seem to have a backbone. The ones telling you their side of the story never give you a reason to care. Harding does present the mean girls/high school queen bees social hierarchy effectively, although stereotypically. 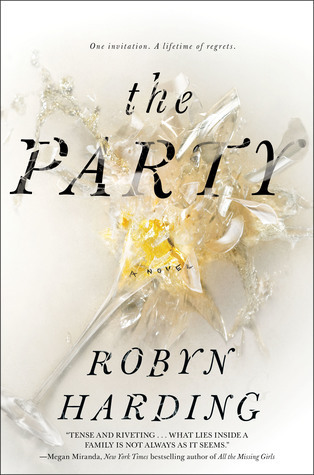 Sometimes I like a novel where everyone is unreliable and unlikable, but it didn't quite work for me here. For me, The Party missed the mark. It had potential, but something just never clicked for me. I grew very tired of all the characters and sort of wanted to lecture them to just grow up, adults and kids. I also found it hard to believe that a sixteen year old would want a sleep over party. Sorry, but that seems absurd to me. It also seemed odd that given they were doing this party, that the parents wouldn't be checking on the girls, staying awake all night to make sure they were following the rules. I'll also admit that I didn't like the ending.